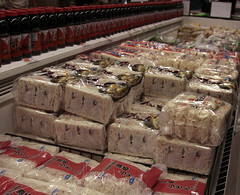 H-Mart, Korean-American Asian supermarket chain, recently opened a location in Burlington, MA. 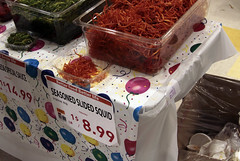 I’m really happy that the region has another Asian grocery store chain (although I’ve long been a fan of the Boston area’s Super 88s). One of the problems of our living in the Upper Valley region of VT/NH is that we don’t really have access to a lot of Asian ingredients (we’ve got two small Asian grocery stores here, but their selection is limited, especially when it comes to produce), which is kind of a shame, since both of us really like Asian cuisines. 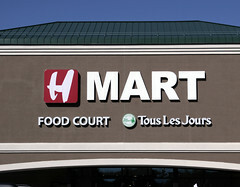 So when we happened to be in the Boston area a few weeks ago for another reason, I remembered seeing in the paper that H-Mart was opening, so Carol and I went there for their grand opening. We really enjoyed it, since we managed to stock up on a lot of produce items that are either impossible to find in the Upper Valley (jiu cai and gai lan, for example), were of better quality (we bought some phenomenal ginger), or just had significantly lower prices. We also tracked down a few specialty items (frozen banana leaves, frozen udon noodles), and really enjoyed the entire department dedicated to kimchi (leaving with a 1 gallon bag of the stuff!). The meat department was phenomenal as well, although I didn’t bring a cooler down this time. I also found a new item that I’d never tried before: “drinkable vinegar”. Basically a fruit flavored vinegar that you dilute down for drinking like a tea. I bought a big bottle of the raspberry flavor, and have been enjoying it. I’d shop here once a week if it was closer. I’ll definitely be visiting again when I’m in the area. Note to self: do not leave a gallon bag of kimchi in your fridge for two weeks, unless you really like the smell of kimchi!